Intel Capital announced at their annual summit, the latest 16 companies to receive funding from the silicon company’s venture arm. The summit kicked off Monday at the Hyatt Regency Huntington Beach attracting over 1,000 Intel Capital portfolio CEO’s and high level employees, venture capitalists and top executives from Global 2000 companies, according to Intel. On Tuesday Intel Capital revealed that their latest round of funding included 16 companies an over $62 million dollars. That’s just a fraction of the $355 million they plan to invest over the course of the year. The investments stretched over a variety of familiar categories including; New Devices/ Wearable Computing, Mobility/Wireless, Advancing Microprocessor and SoC Development, and Big Data and Cloud Infrastructure. Although not the biggest monetary investment, one of the big investment stories out of the Intel Capital summit is that of 13 year old entrepreneur and middle schooler, Shubham Banerjee and his company Braigo Labs. The San Jose based 8th grader has found a way to turn normal Lego building blocks into a Lego Braille printer that makes it possible to print braille at home, affordably. Banerjee’s device, which includes an Intel Edison Chip, costs about $350 rather than the $2,000 that commercially available braille printers cost today. The DailyMail reports that after hearing about Banerjee and his device last year, Intel had him speak at a conference in India. It was there that Intel Capital announced they would invest in the company. Although no official numbers have been released, DailyMail reports that the investment was in the hundreds of thousands of dollars. The Banerjee family is no stranger to Intel or it’s venture capital arm. Banerjee’s father’s company, an educational startup called Kno, was acquired by Intel. That company, which makes interactive textbook experiences for devices, had raised $73.4 million in venture capital before being acquired by Intel. Prior to the Intel investment the younger Banerjee had raised $35,000 from his family. 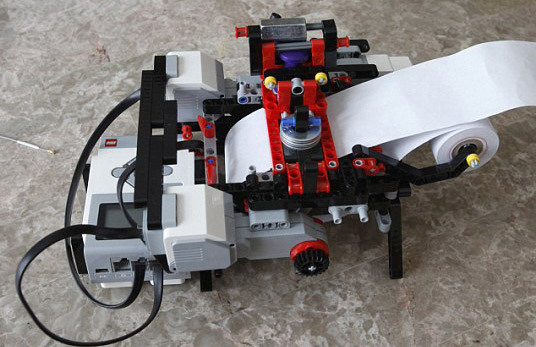 He plans to use the money to begin the mass production process on the braille printers.